New Canaan “Old Timer” Len Paglialunga, a Rams football star in his own right back in the ‘60s, first heard the name Bo Hickey as a teenager. Hickey, a standout Stamford Catholic High School running back, went on to Maryland, the CFL and a single (and outstanding, four TDs) season with the Denver Broncos before injuries sidelined him. 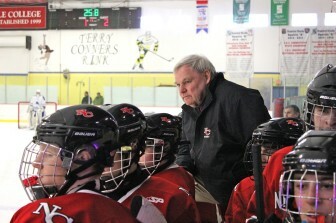 He returned to this area and joined the New Canaan High School football coaching staff under Lou Marinelli, and then 20 years ago, took over as head coach of the varsity ice hockey team—a program he lifted to a never-before seen, consistently high-achieving level. On Monday night, Hickey announced that he’s retiring from the position—a fact first reported by Dave Stewart of the New Canaan Advertiser. The news triggered expressions of respect and fond memories from Paglialunga, like so many involved in New Canaan sports. Many thanks to Paglialunga, Marinelli, First Selectman Rob Mallozzi and NCHS assistant football and baseball coach Chris Silvestri for sharing their thoughts and well-wishes with fellow New Canaanites in the video above.